If you are a power metal appreciator, then adding Live Beyond the Spheres to your streaming services playlist is essential. If you are a fanatic then it is a given that you look at adding the 4-LP version to your collection as the band sound fantastic. I understand that this is the third such release of its type for the lads from Krefeld, Germany, yet this one feels just a bit special. Released almost 15 years after the appropriately titled Live (’03), Live Beyond the Spheres is the live album the band have held promise to release for many years. During the European tour of 2015, 30 shows were recorded in total. 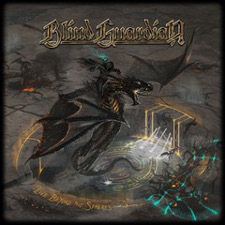 The band hand-picked performances of selected tracks from the shows and as usual with Blind Guardian, the recording quality and performance of selected tracks is near to impeccable. The word ‘balance’ may sound overtly simple when used as a descriptor, however it does fit. At this point in his career, Hansi Kürsch is surely power metal's preeminent statesmen and vocalist. His vocals are placed at the centre of the recording, assuming there was no studio tricks involved during the album’s production his vocal melody is dead on 99.9% of the time throughout. Since 1988’s Battalions of Fear, Kürsch has been the example and model for those talented souls who can produce operatically infused singing. On Live Beyond The Spheres I’d go so far as to suggest that Kürsch consolidates his place as the vocalist most likely to inspire and emulate. When I had a conversation with Blind Guardian’s excellent guitarist Marcus Siepen for an interview recently, I got the impression that the band is measured, meticulous in planning, and take their fans/ audience seriously. Not so seriously that there is a humour vacuum but seriously enough for us fans to understand that when Kürsch says the following about the recording he means it: “In general I would say that we've had a really good run throughout this tour and that nearly every show was perfect. But when you listen to the live-recordings in the studio you realise that almost every evening, at least one member of the band had a bad day. After every one of us had checked through every single song and concert of those 30 shows again and again, there was only something like two or three versions of each song that were suitable to be used for an album. We then had to decide between those final versions; which one the most impressive one was. This was a nearly endless task!" As a musician, I have had the not so thrilling task of sifting through live performances and I can assure the reader, what is heard on the night and what is recorded can sound like separate events. It is truly amazing to hear a raw recording of what you thought was marvellous at the time, to discover it sounds like a band slowly coming to terms with the fact all the musicians are performing the same song, on the same night on the same stage. If you listen to a sole power metal release this year, Live Beyond the Spheres is a worthy candidate for your selection.